Whether you’re just starting out, or you have been working as a graphic designer for a while, using the right technology to provide your clients with your best work is essential. Graphic designers naturally want the best computer that helps them design efficiently and in many cases, a desktop computer can provide a more powerful processor, more memory and a larger display than working on a laptop. But for some, working on a laptop is easier and much more portable so if you’re interested, see our article on the best laptops for graphic designers. Today we’ve decided to take a look at the Best Computers for Graphic Design in 2019, both Mac and PC, so we can help you find the one you need. If you’re ready, let’s get started with what you should be looking at when you go to the store so you choose the one that’s best for you. The GPU, which is also known as the Graphics Processing Unit, is one of the most important parts stuck inside your computer, especially if you plan on doing design work as a graphic designer. A better GPU will provide you with a much better graphics performance providing you with better quality images that you can work with. While whichever computer you buy will have a GPU in it, in time you may want to swap it out for a better one. In this case, you will want to choose the best GPU out there depending on your budget. Having the best graphics card available can make it easier for your computer to display rich colors and striking visuals. The CPU, or central processing unit, is like the brain of your desktop computer. When you turn your computer on, the CPU works to make sure that the programs and functions that are supposed to run on startup. The typical software that graphic designers use on a daily bases can be very processor-intensive and new programs that come out every year or so only add to this intensity. When you’re looking for a computer, the CPU should run at least 1Ghz. This means that it can perform one billion computations per second. Now, 1 GHz is the minimum you should be looking for, but if you have the money to spend, get the fastest processor that you can afford, to avoid lag or problems when you’re working on a project. Ideally, you should shoot for 2 Ghz or more. The processor isn’t the only part of your new desktop computer that can help it run fast. The amount of memory that you have can also play a big part. Memory can also be known as RAM or Random Access Memory. Now, this type of memory is not like the memory that a hard drive uses to store your projects. An easy way to think of this type of memory is like your short-term memory. The RAM keeps stuff at the front of its brain, much in the same way you do when you remember a phone number a few hours later. Like someone with a good short-term memory, the more RAM your computer has, then it can process more things at once. This is because it is much faster to do this than trying to access the hard drive for the files you need. When you look for a computer, shoot for a minimum of 8Gb of RAM. If you can afford to purchase a computer with more RAM, then we suggest doing so. 16GB of RAM is recommended for intensive design work. If RAM is the short-term memory, then the hard drive in your computer is like your long-term memory. Am I the only one picturing Pixar’s Inside Out right now? Anyway, there are typically two types of hard drives out there: Hard Disk Drives (HDD) and Solid State Drives (SSD). While both drives do the same thing essentially, there are some advantages as well as disadvantages to each type. HDD’s tend to be cheaper than SSD’s, coming in at about half the price for the same amount of storage. Where HDD’s stand out is in the ceiling for total storage, being much higher than an SSD, which tends to top out at around 4 terabytes. However, an SSD drive is much more durable because they don’t have moving parts as an HDD does. The biggest difference between the two is in their speed. A computer with SSD boots faster and programs launch quicker as well. If you don’t plan on moving around a lot while you’re working, an HDD is a good option here. Starting at 1TB of storage is a good place to start, while 2 TB would obviously be better. With advancements in tech, as you upgrade, the price will come down so you don’t have to worry about buying the best option right now. In a previous post, we covered the best monitors for graphic design. Many desktop computers still come with a monitor, however, it is not really going to be suitable for your needs in most cases. If you do buy a computer with a monitor included, be sure that the resolution is at least 1280 x 800. The higher the resolution, the better the image on your screen will be, but it can get expensive. There are three different types of monitors, Twisted Nematic (TN), Vertical Alignment (VA), and In-Plane Switching (IPS), for graphic design work, focus on purchasing either a VA or IPS monitor as the quality far exceeds a TN. A monitor with In-Plane Switching is the top of the line when it comes to monitors and the price reflects that. While they can put a serious dent in your wallet, the performance and quality of the images presented make it well worth it. Choosing the best computer for your needs can be a very personal thing. While there are many different options from many different manufacturers, at the end of the day, what you require will make the final decision on which one you buy. However, to us, these are the best computers for graphic design in 2018 and 2019 that we would spend our money on. For many graphic designers, there is no other choice when it comes to the best brand for a graphic design computer than an Apple. It’s not hard to see why that is with the quality and design that the manufacturer has been putting into their products for years now, their biggest supporters have been with them since Day 1. 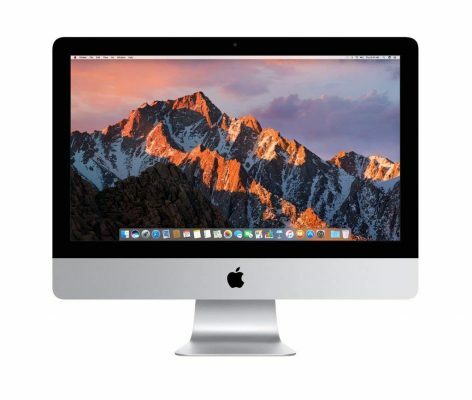 The Apple iMac is an all-in-one desktop computer that sports the same futuristic look that many previous iterations of the computer have already. Where it stands out from the crowd is in the improvements that Apple has brought to an already impressive setup. The CPU contained within the computer is provided by Intel and uses their Intel Core i5 processor. This CPU runs at 3Ghz but if you need a boost, can clock up to 3.5Ghz. 8GB of RAM provides you with enough power to take on just about any task. The GPU, a dedicated AMD GPU is a Radeon Pro 500 comes with 2GB of dedicated video memory, making it twice as fast as the previous model. While it doesn’t come with a SSD, the fusion drive does come with 1TB of room for all of your projects. The 21.5in monitor with Retina display shines brighter than ever. Able to produce up to one billion colors and a brightness of 500 nits, images have never looked better or crisper. On the back of the monitor, you will find 2 USB-C ports, 4 USB ports, and an SDXC card slot which will make it easy to plug in any peripherals you may have. 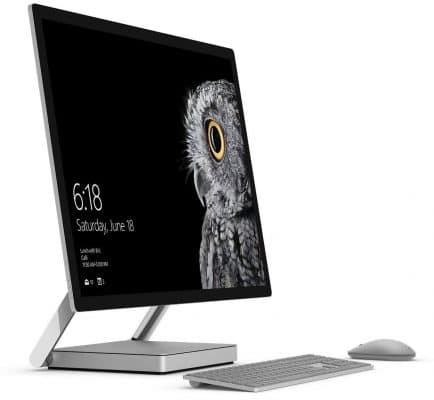 An all-in-one Windows PC, the Microsoft Surface Studio is an impressive piece of hardware that contains a sixth-generation Intel Core i7 processor, the same one in Apple’s MacBook Pro. The Surface also comes with a 2TB hard drive and 32GB of RAM. With a base and high-end Surface Studio models available, each has their own GPU. On the high-end model, a Nvidia 980M, which is great for video editing but is a generation behind what is currently offered. The base model comes with a Nvidia 965M, which is still a very good GPU. The display is what makes the Surface Studio stand out from its competition. With a screen that Microsoft has dubbed PixelSense, it has 4,500×3,000 pixels which can make it a great monitor to use with large design projects. Bright and bold, it includes support for three different color profiles, sRGB, DCI-P3 and a vivid mode, which while impressive to look at, appears to be an overdrive of both the color and brightness slightly. Multiple USB-A ports, an SD card slot, Mini DisplayPort and Ethernet jack adorn the rear of the base, ensuring that you can hook up all of your peripherals. The design of the Surface Studio could be considered a game changer. With a zero-gravity hinge, the screen can be moved from a slight past 90-degree position all the way down to a 20-degree angle, giving it the appearance of a drafting table, which will definitely appeal to graphic designers. The only downside to the Microsoft Surface Studio is the price. To put it bluntly, it is not cheap with the base model starting at $2,999, if you’re starting out in your graphic design career, this may not be for you just yet. At the top of the different options offered by Apple, the iMac Pro is a beast of a machine at its high-end design but like the Surface Studio from Microsoft, its biggest knock is the high price. If you can afford one though, the quality of the internal components are hard to beat. With a 2.3GHz 18-core Xeon W processor, 128GB of RAM, a 4TB Solid State Drive and on top of all that, a Radeon Pro Vega 64 GPU, the iMac Pro can provide a graphic designer with the tools they need to get all their projects done. The 27-inch LED-backlight Retina 5k display creates incredibly vibrant colors, which comes with some help of the maximum brightness of 500 nits as well as the wide P3 color gamut. Throughout the entire design of the all-in-one computer, its monitor is by far the most visually striking feature. With its sleek, one-piece design, your desk is kept free of clutter that can occur with other desktop computers. This sleek design relegates the ports for your peripherals to the back of the computer. With an SD card port, 4 USB 3 ports, a 10Gb ethernet port, and 4 Thunderbolt 3/USB-C ports give you more than enough ways to connect just about anything. 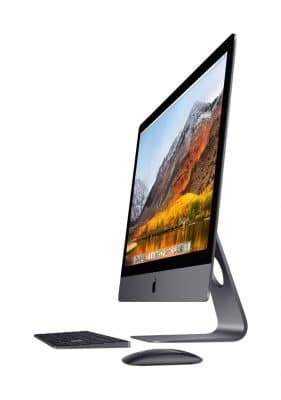 While the high price will obviously keep some from handing over their credit card, Apple has created an all-in-one computer that comes with an eye-catching design and powerful components can help you get any project done and impress your clients. HP is no stranger to making all-in-one computers and with the Envy 34, they have created a quality computer for your graphic design needs. Built with an Intel 7th-gen core processor, a combination of a 256GB solid-state drive (SSD) as well as a 1TB SATA hard drive gives the all-in-one a wonderful balance of speed and capacity. The GPU is an AMD Radeon RX 460 which has enough power to display all of your graphic design projects in pristine clarity. 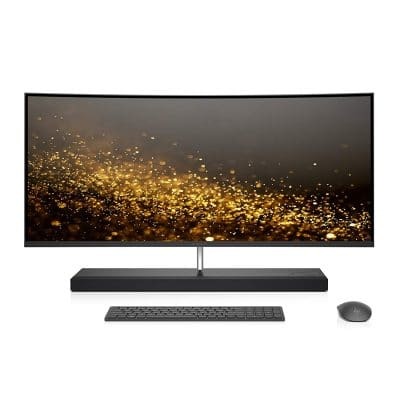 As an all-in-one desktop computer, HP decided to give the Envy 34 a minimalist design keeping from taking up too much room on your desk and causing the ever-annoying issue of clutter. In this vein, the connectivity ports are located in the base of the computer. Four USB 3.0 ports, a Thunderbolt 3 port, along with HDMI Out and HDMI In ports, 10/100/1000 Base-T Network port, plus HP’s 3-in-1 Media Card Reader gives you the ports you need for any of your peripherals or data sources. The most striking feature of the Envy 34 is obviously its 34” curved ultrawide QHD display. An HP Display utility, included in the Envy 34 lets you put the monitor into a Technicolor-certified mode that will make the colors on the screen pop and also have a sRBG color gamut of 99 percent. For those who don’t know what that means, this can make images appear truer to life when compared to other monitors. The biggest detraction for the screen is that while the curve of the screen is impressive, it can also make straight lines and picture borders appear curved, which may cause problems for graphic designers or other artists. The Aspire from Acer comes with a minimalist design, but don’t let that fool you into thinking that it means that it is lacking in any way. Normally found mostly in ultraportable laptops, the Aspire comes with an Intel Core i7 CPU along with an Intel GPU. This doesn’t make it out to be a powerhouse of a computer, but the 16 GB of RAM. which is expandable is definitely impressive. A 2TB HDD give you a huge amount of storage right out of the box. The main point of focus for graphic designers looking for a computer should be on the monitor the Aspire comes with. An IPS (In-plane switching) display, this means that you are provided with really good color reproduction as well as wide viewing angles. The monitor is also provided with features that help enhance your experience and help lessen common issues, ExaColor provides extra color saturation as well as contrast while Bluelight Shield helps to cut down on the blue light that can hurt your sleep. 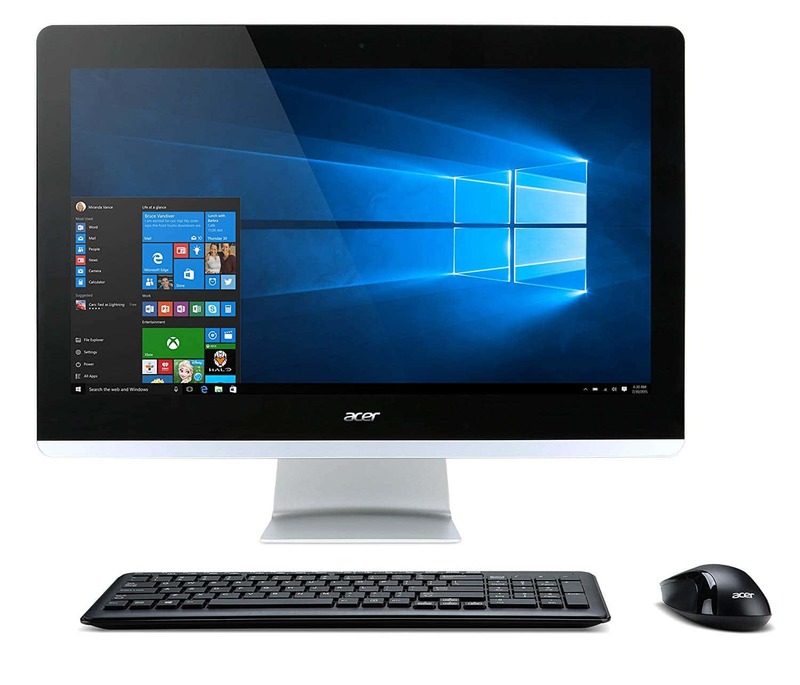 The Acer Aspire is a quality desktop all-in-one computer that while on the surface may not be the most impressive computer, the design, components, and affordable price make it one to consider. Am I the only one who remembers the old “Dude, you’re getting a Dell” commercials? Maybe I am, but Dell has made a lot more high-quality computers since those days and the XPS 8930 Tower is no exception. The first thing that needs to be covered is that this is only a computer tower and does not have a monitor included. This can be good and bad in some cases If you have a high-end monitor in mind that you want to use, then buying just a tower can be a good thing. However, if you’re looking for a computer you can take out of the box and go, this might not be for you. 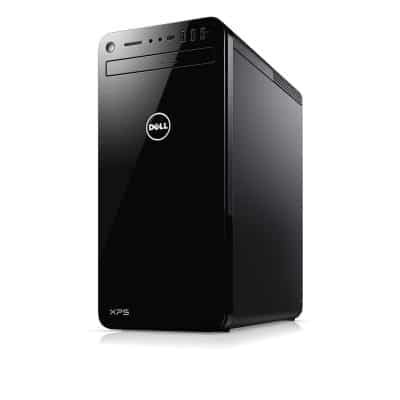 Packaged within the tower’s frame, the 8930 comes with an Intel Core i7-8700 processor. The combination of a 256GB solid-state drive(SSD) plus a 2TB 7200 RPM SATA Hard Drive gives you the boot memory and storage you need to run and save every program and project you could ever need. The GPU is a Nvidia GeForce 1060 that comes with 6GB of graphics double data rate type five synchronous random-access memory, or it’s much easier to remember label, GDDR5. The graphics card can help make even your most colorful projects pop off the monitor that you choose to pair with this machine. Dell uses a tool-less system when building their PCs and makes it easy to upgrade just about any of the components in the tower, except for the CPU which is soldered on. So while it comes with 64GB of RAM, it can easily be upgraded. A good selection of ports, including two USB-C, a USB-A, HDMI, DisplayPort, and SD Card Reader gives you options for whichever peripherals you want to plug in, although a monitor should be the first one. A gaming PC? I know what you may be thinking, we’ve lost it. That we’re showcasing the best computers for graphic design, not gaming. You’re right, of course. However, in many cases, manufacturers tailored PCs for gamers that have the internal hardware that also makes them an excellent choice for graphic designers, like the CUK Continuum Gamer PC. While designed for a gaming enthusiast, the components that make up this very high-quality desktop computer can appeal to graphic design professionals as well. With an 8th generation Intel Core processor which at its max can have a frequency of 4.7GHz and up to 12MB of cache memory thanks to the six cores used for processing power. The graphics that you work on need to look their best or your work isn’t going to look its best and with the Nvidia GeForce RTX GPU uses breakthrough technology to make any graphics look as real as possible. With all of this hardware, it’s sure to get hot in the computer case, and to help, 5 pre-installed fans to create excellent airflow and keep the system cool. At its top model, it comes with two 500GB SSD and a 2TB 7200RPM HDD for super fast program loading and more space than you might ever use. The 32GB RAM that PC comes with is easily expandable if needed. Like many high-end computers, the downside to this one is its price. 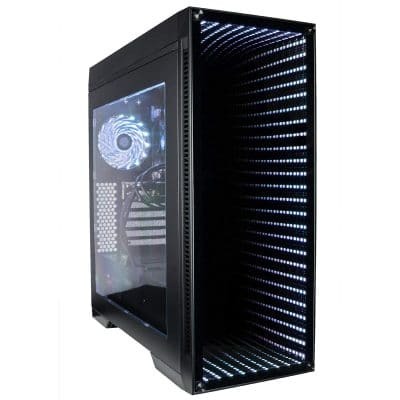 At close to $3,000 for the top of the line model, while it is an amazing desktop computer, it is something that you wouldn’t want to make an impulse buy on. On the other end of the pricing spectrum, not everyone may be at the place in the graphic design career where spending a lot of money on a computer is feasible. But does that mean you have to suffer from a lower quality product that may hurt your career more than it could help? Not with the HP Pavilion Power Gaming Desktop Computer. An 8th generation Intel Core i5-8400 processor is tucked inside its case along with a Nvidia GeForce GTX 1060 GPU that has a dedicated 3GB GDDR5, as well as 8GB of RAM which can be upgradable to 64GB to help your programs load quicker and your projects, look amazing. A solid-state drive (SSD) provides you with 256GB of storage, which is large enough for even the biggest projects you need to get done. Connecting any of your devices is super simple with a cluster of ports on the front of the device including 2 USB 3.1 Gen 1 and 2 USB 3.1 Gen 2 ports, and a USB 3.1 Gen 2 Type-C port. 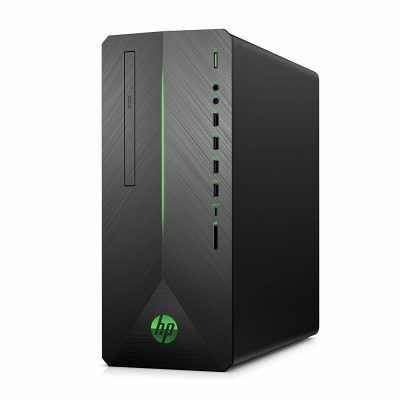 The biggest attraction of the HP Pavilion Power Gaming Desktop Computer is its price. At under $1,000, it can be the perfect choice for a graphic designer who may just be starting out and is working on a budget. What is the best desktop computer for graphic designers? Choosing the best computer for your needs as a graphic designer can be a tricky process if you let it be. Knowing what you are looking for and the budget you have can help make choosing the best choice much easier. Not every computer is the same, and even small differences can make a big difference down the road.